The Collinsville City Commission met Monday, Nov. 20th (at the City Hall Community Room, 106 N 12th Street) for a 6pm special session followed by the 7pm regular meeting of the City Commission and Municipal Authority. Ted Note: I have just sumarized the agendas below. The official agendas are available at cty hall. * (6pm) Executive session to discuss selection and possible hiring a city clerk. -- no action was taken after returning to the public portion of the meetings below ... then returned to executive session again after those meetings. Commissioner Bateman left before the meetings below. Trustees Sallee, Porter & Rigdon were present. Trustees Bateman & Rogers were absent. * Discussion and possible action concerning approval of mortgage for purchase of Fugate property. -- bids received from all three local banks were very similar. RCB's financing plan at 5.49% was approved. Roll call and declaration of a quorum. 4. CONSENT: All items listed under the Consent Agenda are deemed to be routine in nature by the governing body. They will be approved by one motion of the governing body. Items on the consent agenda will not be discussed. Any member desiring to discuss an item may request that it be removed from the Consent Agenda and placed on the regular agenda. It will then be discussed and considered. A. Approval of minutes of the previous regular meeting. D. ... amending retirement trust ... relating to qualified domestic relations orders. -- The rezoning request was approved (without a clear understanding why the rezoning was not done years ago). 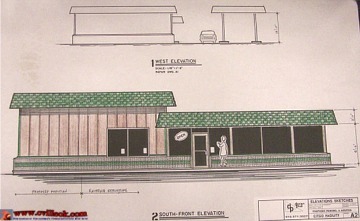 The plans for expansion of the existing Citgo business were displayed but not actually part of this rezoning step. 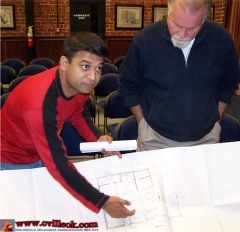 "Mo" shows details of plans to expand his Citgo business at 15th & Main (including a dining area).